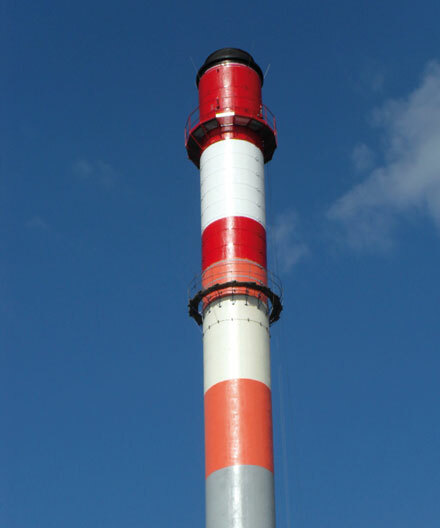 MCC2I is an expert company in the maintenance of concrete, brick or metal industrial chimneys up to 300 meters in height. 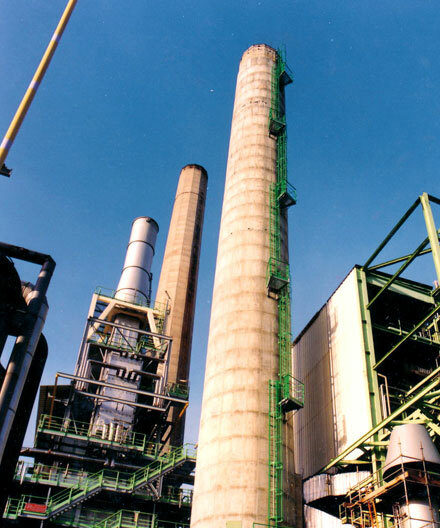 Since 1996, MCC2I has been offering industry the benefits of its know-how, for sectors including petrochemicals, glassworks, cement, incineration, nuclear, steel and urban heating, in Europe and Africa. MCC2I carries out surveys, maintenance work, demolition and even the complete replacement of any concrete, brick or metal chimneys. We rely on our organisation and the way we can mobilise our human and material resources to respond to your needs. MCC2I enjoys an excellent reputation for its ability to stick to deadlines by adapting to the frequent changes to organisation and schedules inherent in planned shutdown or damage repair work. 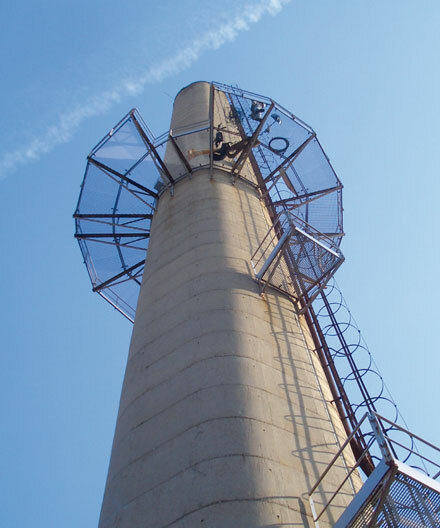 All of our site teams are qualified aux to do work at heights and in sensitive areas. 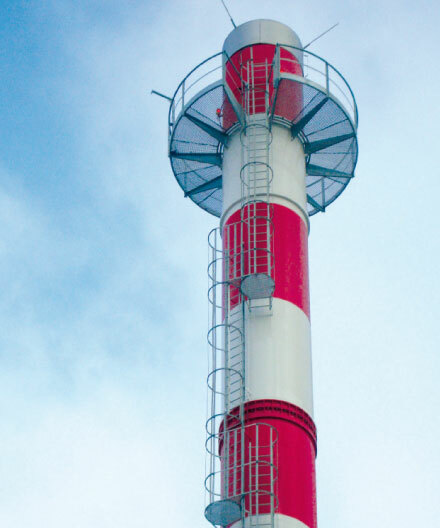 Our equipement complies with the standards in force, including NF EN 1808 relating to safety requirements for suspended platforms at variable heights. 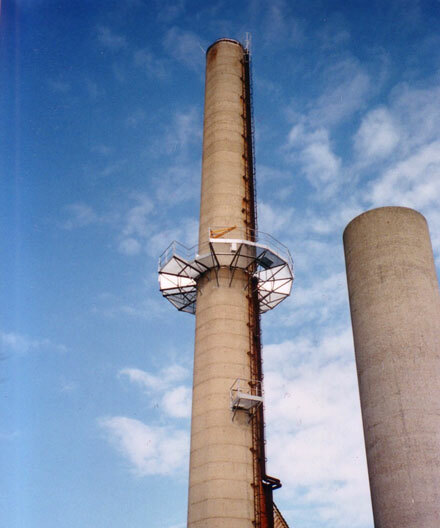 The fixed ladders and platforms were out-of-use because of corrosion. MCC2I designed, produced and installed ladders with staggered runs and platforms to comply with NFE 85-016 and ISO 14122-4. All of our ladders and platforms can adapt to your existing facilities. 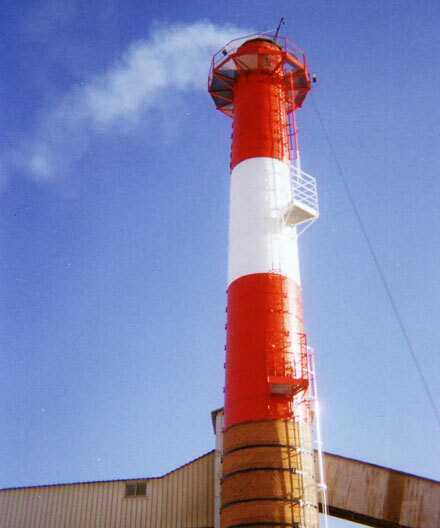 The chimney had not been surveyed for 5 years. 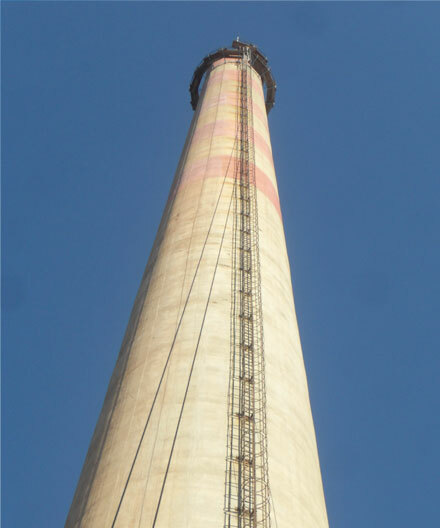 MCC2I carried out an internal and external inspection of the chimney, checked the equipment and submitted a report with its recommendations. A preventative maintenance schedule has been planned. 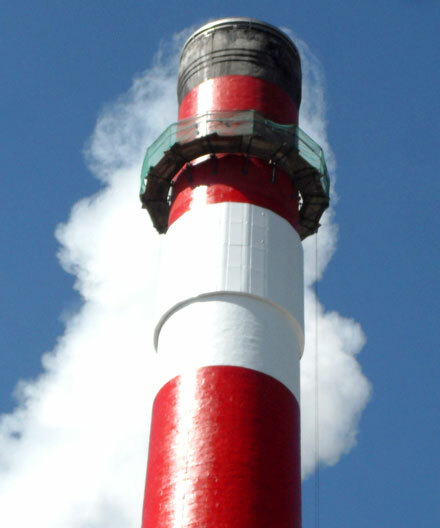 The survey revealed that there was a risk that the last few metres of the chimney would collapse. MCC2I carried out repairs on the cracks and adjusted the reinforced sheaths to extend the lifespan of the structure. The last 15 metres were covered in soot, which had worn away the daytime markings. MCC2I carried out the external cleaning of the load-bearing shaft before applying several layers of protective paint to the highest standards. Following on from DREAL's comments, we realised new measurements needed to be added. MCC2I sized up, designed and installed the necessary reinforcements, then created some openings in the concrete shaft so the collection containers could be installed. The last meters were very degraded. 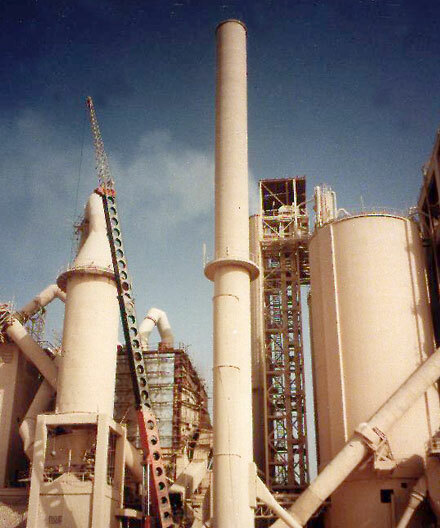 MCC2I took in charge the conception, studies, manufacturing of a concrete lining, which was installed at the top of the stack. 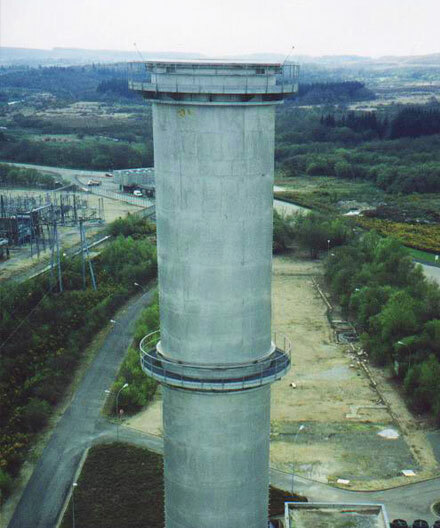 Our survey revealed that the surface of the load-bearing shaft had been damaged by acid attacks and wear and tear over time. MCC2I repaired the cracks and spalling then covered the whole thing with several layers of protective paint. The daytime and nighttime markings need work to make sure they were compliant. MCC2I repaired the nighttime markings and then painted the existing daytime markings. The three rows of bricks at the top of the chimney were out of use. MCC2I introduced specific internal access routes so work could be carried out in total safety. All of the bricks and seals over around 18m were replaced. 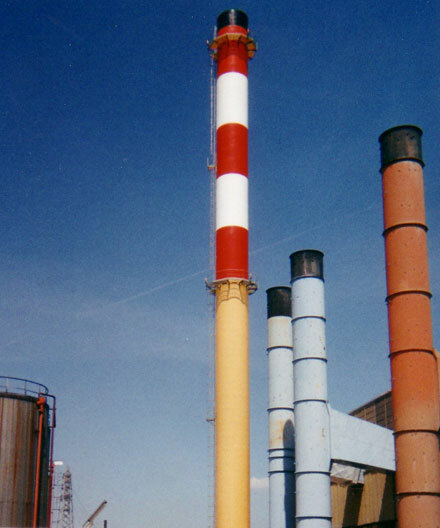 The plant was being converted so it could use natural gas rather than heating fuel. MCC2I carried out the piping work, which involved installing a metal pipe in the chimney so that the bricks were no longer in contact with the smoke. 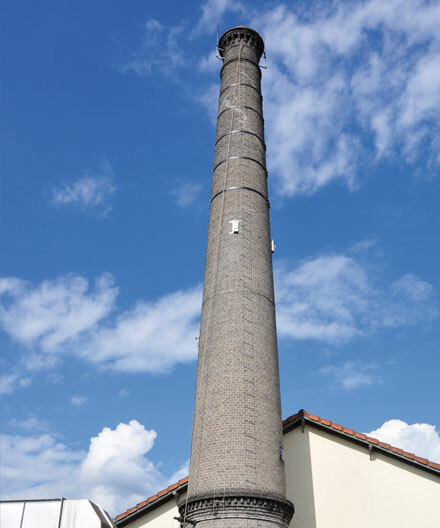 The chimney needed to be shortened. MCC2I completed the partial deconstruction of the chimney and then cleared it, at a working plant. The survey revealed traces of corrosion on the access routes. MCC2I treated the areas with an anticorrosion product and then painted them using RAL according to the client's preferences. Copyright ©2012 . All rights reserved.